Groundbreaking and heartbreaking, this triumphant novel by two of America's most acclaimed storytellers follows a family of women from enslavement to the dawn of the twenty-first century. From Reconstruction to both world wars, from the Harlem Renaissance to Vietnam, from spirituals and arias to torch songs and the blues, Some Sing, Some Cry brings to life the monumental story of one American family's journey from slavery into freedom, from country into city, from the past to the future, bright and blazing ahead. Real-life sisters, Ntozake Shange, award-winning author of for colored girls who have considered suicide/when the rainbow is enuf and Ifa Bayeza, award-winning playwright of The Ballad of Emmett Till, achieve nothing less than a modern classic in this story of seven generations of women, and the men and music in their lives. Opening dramatically at a sprawling plantation just off the South Carolina coast, recently emancipated slave Bette Mayfield quickly says her goodbyes before fleeing for Charleston with her granddaughter, Eudora, in tow. She and Eudora carve out lives for themselves in the bustling port city as seamstress and fortune-teller. Eudora marries, the Mayfield lines grows and becomes an incredibly strong, musically gifted family, a family that is led, protected, and inspired by its women. 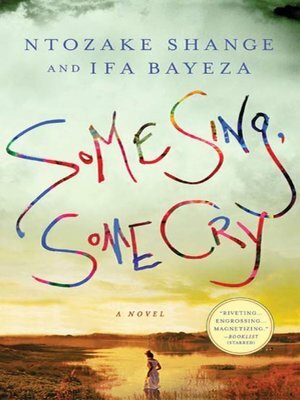 Some Sing, Some Cry chronicles their astonishing passage through the watershed events of American history.